"Arafel": PMQs: Ian Duncan Smith Quizzed Over UNCRPD Inquiry into Systematic Abuses of the Rights of the Disabled, Suicides Caused by Loss of Benefits and the "Public Philanthropy" of the Food Bank. PMQs: Ian Duncan Smith Quizzed Over UNCRPD Inquiry into Systematic Abuses of the Rights of the Disabled, Suicides Caused by Loss of Benefits and the "Public Philanthropy" of the Food Bank. Quote; "No doubt the secretary-in-a-state about work and pensions won’t admit it, but any cabinet minister who comes under such a sustained assault during questions to the Prime Minister must be doing something wrong. 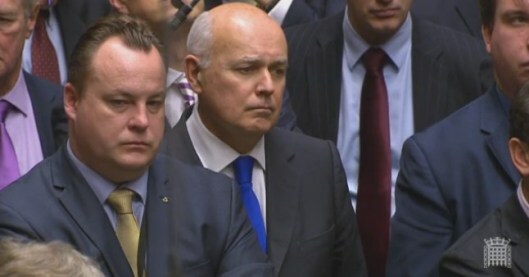 Iain Duncan Smith was attacked over the United Nations’ inquiry into the possibility that the UK has committed grave and systematic abuses of the human rights of disabled people, over suicides committed by benefit claimants due to DWP decisions, and over the vertiginous increase in food bank use. Just because David Cameron had to field the question, that doesn’t mean the Gentleman Ranker shouldn’t take the blame. All this, on the day his new mascot (ha ha), a demonic-looking furry something called, ironically, Workie, made its debut in a nationwide TV advertising campaign costing more than £8.5 million. That’s money that could clearly have been better-spent elsewhere. “The United Kingdom is currently being investigated by the UN Committee on the Rights of Persons with Disabilities because of allegations of ‘grave and systematic` violations of disabled people’s human rights. Cameron, perhaps briefed by his Work and Pensions secretary, would not. First, he twisted the question, trying to make it about the number of disabled people who have gained work under the Conservatives (tens of thousands, he reckoned. How many lost their jobs when the Tories closed Remploy, again? Nearly 2,000? And how many of those tens of thousands have gained permanent work? He didn’t say. He continued: “Of course I will look at any United Nations investigation, but sometimes when you look at these investigations you find that they are not necessarily all they are originally cracked up to be.” Like Tory promises on tax credits (for example)? “There are many disabled people in our world who do not have any of the rights or any of the support that they get here in Britain, and I think we should be proud of what we do as we co-operate with this report.” Shifting the goalposts, there. Bad conditions endured elsewhere in the world are not an excuse for a Conservative Government to worsen conditions here. This was something of a missed opportunity as Mr Robertson could have asked why nobody has been prosecuted for causing Mr O’Sullivan to take his life. Never mind; This Writer has something in the pipeline about that, which will hopefully bring out some useful information. Cameron didn’t have any: “I am aware of the case the hon. Gentleman raises, although I am sure he will understand that it would not be appropriate for me to discuss the specifics of the cases. Suicide is always a tragic and complex issue. We should take these matters incredibly seriously.” More seriously than this Prime Minister, certainly. “I will look very carefully at the specific question he asks about publication.” But will he actually publish anything? And if so, will it be as opaque as the death figures the DWP released on August 27? “We have changed the work capability assessment to lead to significant improvements, following a number of independent reviews, to make sure that people get the support that they need, and I think that is vitally important.” No – because the work capability assessment is still based on a disproved theory that illnesses and disabilities are all in benefit claimants’ minds. Is that one of the achievements that make Cameron “proud”, as he stated in his response to Mr Corbyn? He didn’t, so he quoted some figures about unemployment instead. “Of course, I do not want anyone in our country to have to rely on food banks,” he lied (if he doesn’t, why have his policies led to such an exponential increase in their use?) before going on to highlight other Tory economic policies, at least one of which – the so-called National Living Wage – demonstrates perfectly why we cannot trust Tories. A living wage is one that provides enough for people to cover all their costs without going into debt or resorting to benefits – unlike the forthcoming Tory version. If they can lie about that, they can lie about everything else.